What a great way to address my anxiety and stress! Ann's calm voice and detailed guidance creates the perfect way for me to identify where my stress is held in my body. I feel a wonderful calmness at the conclusion of the video. Throughout my clinical career I have been drawn to practicing within a holistic framework, integrating thoughts, emotions and physical sensations in the moment. The world of neuroscience, especially embodied cognition and consciousness studies, has greatly influenced my psychotherapy work and the formulation of my interventions. I have developed a technique, used within talk therapy sessions, that allows you to become aware of patterns, both in the mind and body that may no longer serve you in your life. Together we work on re-framing and re-programming these patterns. In the past, I have trained in Gestalt group psychotherapy as well as Relational theories. Ten years ago I obtained my 200 hour yoga teacher certification and went on to complete over a thousand hours of additional training in yoga (E-RYT-500), yoga therapeutics, and yoga therapy. The emphasis of my yoga therapy training has been on mind/body integration, which has greatly influenced my clinical work. 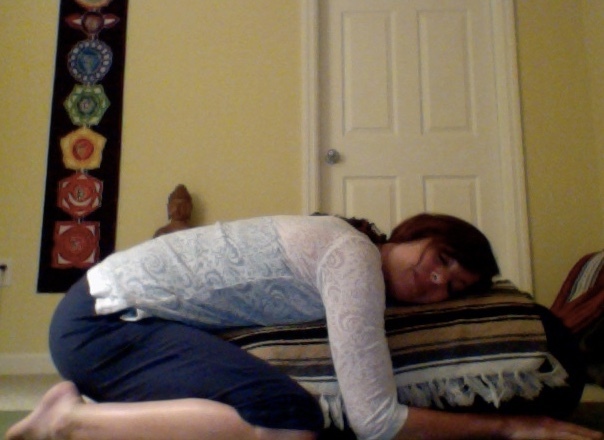 Restorative yoga is known as the yoga of resting and digesting. It is a passive practice, meaning you will be resting in poses through the use of props, such as a bolster, blankets, and blocks. Restorative yoga has a powerful effect upon your nervous system bringing it back into balance and ease. It does this through regulating your breath and gently opening areas of your body, especially your spine, to promote a specific nervous system response. When our nervous system is at ease, our breathing regulates, digestion takes place, and we come back into a balanced mind and body as one. This hour-long program introduces you to a simple sequence of restorative poses that are purposely designed to work with your nervous system to provide relief from anxiety, restore a stressed mind and body, and heighten healthy body awareness. You will be verbally guided throughout. The therapeutic dialogue used teaches you skills of internal, sensory-based body awareness. Anxiety reduction and internal sensory-based body awareness are important tools for self-awareness, stress reduction, and the development of a healthy relationship with your body. The practice begins with an introduction of what you can expect in the poses, a beginning meditation for intention-setting, a sequence of six restorative poses, and an ending meditation for integration of the practice. Two yoga blocks or 3-4 small firm pillows (preferably decorative couch pillows. They work best). 3-4 yoga blankets or 3-4 large blankets from home (full or queen size). A large round bolster (28 inch size) or a rolled yoga mat. "Restorative Yoga for Anxiety, Stress Reduction & Body Awareness by Dr. Ann Saffi Biasetti. The treatment of eating disorders most often focuses on the “talking cure” of psychotherapy where people are encouraged to speak about their problems with food, anxiety, and depression in order to resolve these struggles. But what about the body which is the source of so much anguish and conflict for people with eating disorders? How do we integrate healing the body along with one’s emotions? Dr. Ann Saffi Biasetti, an eating disorder psychotherapist as well as a yoga therapist, offers a helpful way to make peace with your body through her Restorative Yoga program. In this video, the author explains that restorative yoga is known as the yoga of resting and digesting. “Restorative yoga has a powerful effect upon your nervous system bringing it back into balance and ease. It does this through gently opening areas of your body, especially your spine. When our nervous system is at ease, our breathing regulates, digestion takes place, and we come back into a balanced mind and body as one.” This hour-long video introduces a sequence of restorative poses that are intentionally designed to work with your nervous system to provide relief from anxiety, repair and refresh a stressed mind and body, and heighten healthy body awareness. The practice begins with an introduction to explain the poses, a beginning meditation to help you decide on a healing goal to focus on, a sequence of six simple, restorative postures, and a final meditation. Dr. Saffi Biasetti offers verbal instruction throughout as two women demonstrate these restful poses. Through this video, the author provides techniques that will help you regulate emotions and create a healthy relationship with your body which is the cornerstone of all eating disorder recovery www.anembodiedlife.com." Review submitted by Mary Anne Cohen, Director, The New York Center for Eating Disorders at www.EmotionalEating.Org.